You may be thinking "who?" and "where?" and "you what? ", but by the end of this review I hope you'll be asking "why haven't I been?" Linley Sambourne was a cartoonist for Punch magazine, and a privileged social climber. His position owed more than a little to luck, gaining his apprenticeship in 1867 via a friend of the family who just happened to know Punch's editor. A forty year career followed, rising up the ranks to become the magazine's chief cartoonist with a recognisably Victorian style. It wouldn't surprise me if there's still a doctor's waiting room somewhere with some of his work piled on a table. 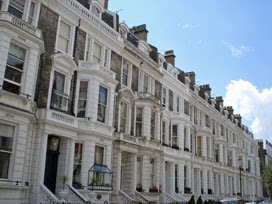 Success allowed Linley to establish a family home in Kensington. 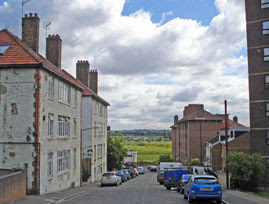 18 Stafford Terrace was a tall townhouse with a scullery in the basement and maid's room in the attic, with the floors inbetween bedecked in the very latest middle-class style. Most similar properties have long been gutted and modernised, but the Sambourne house has survived pretty much untouched thanks to the efforts of the Victorian Society. 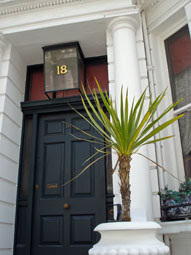 This august preservation body held its very first meetings here at number 18 fifty years ago. The place later passed into the care of the Greater London Council, and today the Royal Borough of Kensington and Chelsea are in charge. Rest assured, the building's in good hands. You'll only get to go round the house if you time your visit for one of the ten weekly tours. Some of these are fairly ordinary, but a few are costumed affairs led by a talented actress and they're the tours I'd recommend. Booking in advance is advised, although I just turned up and got lucky. You might not want to be so reckless. Entrance is via the mini-shop in the basement, and the tour begins with a 10 minute video introduced by Linley's great-grandson, the Earl of Snowdon. From there a RBKC operative will lead you back out into the street and up to the front door, beyond which awaits your host for the next hour. Our chaperone was Mrs Reffell, the Sambourne's engaging and chatty cook, although on other occasions I suspect the tour guide is a character from above stairs. Never once stepping out of character, she led us around the interior from one room to the next, recounting stories and anecdotes about the family of the house. In the dining room we heard of the dinner party the Sambournes had enjoyed 'last night', and were also treated to intimate snippets of social gossip. That Mr Oscar Wilde, they'd been round to his recently, whereas Mr William Morris and his wife weren't quite the consummate hosts they'd expected. Mrs R pointed out the expensive Morris wallpaper her employer had pasted up and told us (scandalously) how much it had cost. All the facts and anecdotes were historically accurate, of course, and had been lifted from Marion Sambourne's diary. Up in the attic we entered Linley's airy studio. A back catalogue of sketches and prints filled several shelves, all of the boxes the genuine article, as was the old wooden desk and assorted objects thereon. A central easel supported a somewhat saucy cartoon, composed (as with all LS's later work) by photographing live models with his new-fangled camera and then copying the result. Often the live model was a member of the family, press-ganged into standing in the garden in some ridiculous costume or holding some important accessory in their hand. The bathroom doubled up as a dark room, and a display of prints across the east wall confirmed that the master of the house had a particular fancy for snapping semi-clad females. Mrs Reffell ushered us out of there fairly swiftly, simultaneously thrilled and embarrassed by her master's fruity fetish. More rooms to see, ending up in the perfectly preserved first floor drawing room. Again various points of period detail were highlighted and set in context, like the elegant vine painted on the mirror by the front window which was actually covering a crack and had been added to save buying a replacement. Delightful, and the hour was over too soon. Mine was a (very) lightly-attended tour, but the actress playing part of Mrs Reffell made every effort throughout to involve us all in the experience. "Do you have a bicycle, sir?" "Are those really your normal clothes, madam?" We responded with good-natured bonhomie, slightly out of place as visitors from the future, but very much the welcomed guests. The more you join in and interact, the more you'll enjoy it. And you will enjoy it. Why haven't you been? Edgware Road (platform 2) round to Tower Hill: All absolutely normal. The train said CIRCLE LINE on the front. Given that nobody this far out would be travelling beyond Paddington, nobody could possibly be confused. Aldgate: Somewhere round the bend from Tower Hill, the destination on the front of the train changed. It no longer said CIRCLE LINE, it said HAMMERSMITH (via Shepherd's Bush). The 'Next train' indicator, however, still read 'Circle Line via King's Cross'. Liverpool Street to Baker Street: The front of the train said HAMMERSMITH (via Shepherd's Bush), and the 'next train' indicators on the platforms also said 'Hammersmith'. There were absolutely no trains labelled CIRCLE LINE. I wonder how many passengers over the weekend waited patiently for a Circle Line service that never ever arrived. Edgware Road (platform 4): The train driver did sterling work reading out all the important options for those changing lines. Going to Hammersmith? Stay on. Going to Paddington? Stay on. Going to Wimbledon? Get off and cross (easily) to platform 3. Going to High Street Kensington? Erm, well, maybe the next train's from platform 3, or maybe it's up and over the steps to platform 2, I'm not sure, listen for announcements. This is likely to become a much-despised connection in the future, trying desperately to work out which train's leaving next from one of two non-adjacent platforms. Paddington (H&C): In the past, most passengers trying to get from King's Cross to Paddington would have arrived at Paddington (District & Circle) station. It's well positioned for the Mainline concourse, and connects easily with Bakerloo line services. In future, after the Circle line splits, everybody's going to end up at Paddington (H&C) station instead. This is a nasty small station with inadequate exits, located a long way away from most of the mainline services, and requiring considerable unpleasant yomping of heavy luggage. Expect a higher number of missed connections in the future. Royal Oak to Hammersmith: Fantastic. The split-Circle arrangement brings twice as many trains to Hammersmith, so West London residents are the true winners here. For the rest of us, alas, this change means all change. Prepare to hate it. Happy 100th birthday to the Science Museum. They had cake on Wednesday evening. Bet you missed it. It's not the building that's 100, nor the collection inside, but the museum's name and identity. For it was on June 26th 1909 that the "Science Museum" formally split itself off from the V&A across the road. Originally the South Kensington Museum, this repository started off as a museum of the industrial and decorative arts, funded from the success of 1851's nearby Great Exhibition. The steady accumulation of apparatus and instruments during the 19th century created a growing technological nucleus, until eventually the separation of the artistic and scientific collections became necessary. And it's the centenary of that divide which is being celebrated today. If you've not been down to the Science Museum since you were a kid, you may not have realised that it's changed. If you have offspring of your own, however, you're probably more than familiar with the place. The heart of the collection's still reassuringly familiar, but there's now a lot more now to appeal to a younger more interactive generation. Oh yes, the Science Museum is a sprightly centenarian, and no mistake. Once you've got past the two shops near the entrance, most people start by exploring the Making the Modern World gallery. This is a timeline of world-changing artefacts extending the length of the ground floor (with a darkroom of space artefacts positioned anachronistically along the way). Ten exhibits have recently been picked out as special Centenary icons, and these are marked by a special plaque on the floor alongside. You're invited to stand in awe in front of each amazing object in turn, and then vote for which of the ten you believe to be the most groundbreaking afterwards. First up is the steam engine, invented two centuries before this museum was born, and then the rather younger V2 rocket, whose engine transformed the way we think about warcraft and propulsion. A few of the ten are included because of what they represent, not because the example on show is anything particularly special. An electric telegraph, a Model T Ford, a model of the DNA double helix. But a few are the breathtaking genuine article. 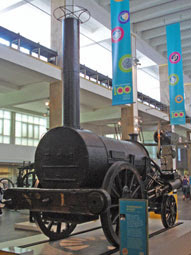 That's Stephenson's Rocket, the first proper steam locomotive, so close that you can almost touch it (please don't). The specks in that tiny brass case are mouldy samples used by Alexander Fleming to isolate penicillin in the 1930s. And that squat cone-shaped metal box at the far end of the gallery, the one with the seriously burnt bottom - that's been round the Moon, that has. It's the actual Apollo 10 capsule, part of a dress rehearsal for the lunar landings 40 years ago, and here it is for you to view in deepest Kensington. What's not to love? Keep going and you'll reach the newest part of the museum, the high and airy Wellcome Wing. There are some push-button futuristic screen bits on the upper floors, but this extension's really about making money. Buy your tickets for the IMAX 3D cinema here ('U' certificate only), or maybe stop off to purchase the results of an experiment involving coffee beans, lactose and boiling water. Just don't go looking for the excellent Launchpad in the basement - they've moved the hands-on physics extravaganza up to the third floor. Note to interested adults: you'll have more fun (and get fewer funny looks) if you take an eight-year-old with you. 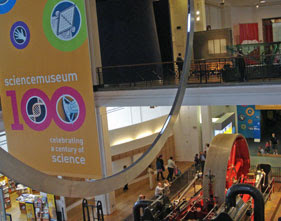 But you'll find the genuine Science Museum tucked away on some of the other floors, away from the major attractions. Many of these areas haven't been upgraded in years, and visiting cub scout groups show their displeasure by nipping hurriedly through the heritage displays in seconds. The Mathematics section, for example, still looks as if a bunch of 1950s geometry teachers made some 3D shapes out of coloured card and then bunged in a few slide rules and pairs of compasses for good measure. The Computing area, once cutting edge, is now lodged firmly in a historical era of cogs, valves and chip-fitted Sinclair calculators. And the Maritime galleries contain an unfeasibly large collection of diving helmets, oil-rig drill-bits and propeller shafts. The number of model ships gathered here verges on the obsessive, and on entering yet another aisle to see yet another British Empire steamboat in a glass case it's easy to imagine that you're still seeing the museum as it was 100 years ago. If you've not been back to the Science Museum lately, maybe this weekend would be a good choice. Three days of special centenary events kick off today and run through until Sunday, and will no doubt attract large crowds. Alternatively, why not wait and sneak in midweek before the school summer holidays begin. Then maybe you can go stand on the flat-packed plastic suspension bridge without being knocked over, or go play on the pulleys in the Launchpad when nobody's looking, or just go and admire the very finest technological exhibits laid out in all their glory. The Science Museum is for kids, but it's not just for kids. And 100 years on, its history is still the future. Bow's buses are changing. Changing a bit, anyway. And I know that some of my readers actually live round here, and occasionally catch buses, and might care, so here's the heads-up. Other readers may want to come back tomorrow, when I'll be visiting somewhere you've actually been. 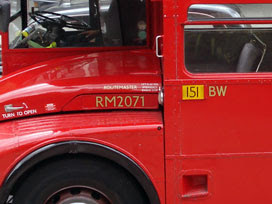 It's five years this month since London's beloved Routemasters were withdrawn from Route 8, which kicks off in Bow. Five years on something else is being withdrawn, at the end of service tomorrow, and that's the last mile of the route. Number 8s have been chugging down to Victoria since 1992, but from Saturday they'll be stopping short and terminating at Oxford Circus. There's a good reason for this curtailment, apparently, which is that Oxford Street is seriously over-stuffed with buses. By stopping the number 8s short there'll be 20 fewer buses an hour clogging up the 500 metres of road between Oxford Circus and Bond Street stations, and every little helps. To make up for this break of service, and to ensure that buses still serve the middle of Mayfair, another route is being extended. Buses on Camden route C2 (which currently terminate at Oxford Circus) will now continue down to Victoria, carefully avoiding Oxford Street along the way. East London residents will then need to take two buses to get to Victoria, not one, which'll cost a few pay-as-you-go users twice as much. On the plus side, however, a shorter journey for the 8 ought to make the service more regular and reliable. The N8's also being cut back from Victoria to Oxford Circus. Need to get a night bus from Victoria to East London? Sorry, but from Saturday no single bus will take you further than Liverpool Street. 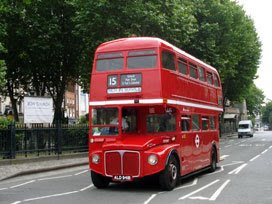 TfL still run two Routemaster services, one of which is on route 15. 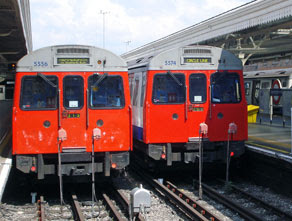 Ten old buses are used to run the timetable, and the entire stock is currently held at Bow Garage. This means that the buses have to run empty into town from Bow in the morning, and trundle back to Bow at night. So if I'm ever outside my house at quarter past nine in the morning, there's often a big red Routemaster trundling by on its way to the City. The sight never fails to make me smile, because it means that RMs linger on in Bow even five years after they were officially culled. But not any more, not after tomorrow. On Saturday these heritage Routemasters are also being relocated to West Ham Garage. Off will come the "BW" plate outside the driver's cab, to be replaced no doubt by a less local "WH". And I'll never see these characterful workhorses chugging round Bow Church again, which is a damned shame. Ding ding. It's five years tomorrow since bendy buses were first introduced on Route 25. Sorry, they're not changing at all. By rights the 5-year contract ought to be ending this weekend, but a two year extension means Boris can't remove Bow's bendies until at least 2011. And one bit of good news for local residents, but you'll have to wait a bit. At the moment there's only one bus that goes down Bow Road to central London and that's the 25. From 29th August there'll be another, because the 205 is being extended from Mile End to Bow Church. At last, a choice of bus that isn't bendy. At last, a choice of central London destination that isn't Oxford Circus. And (even better) the 205's a 24 hour service, so if you're staggering east to E3 after a heavy night out and the bendy 25s are full, at last there's an alternative. You lose some, you win some. Was it a bit warm on your tube train yesterday? Aww, poor you. Then you'll probably have been over-excited by this report in yesterday's Evening Standard, which I've reproduced below. Don't be over-excited. Here's why. That's a very carefully worded headline. It says nothing untrue, but you've probably read far too much into it. The cooler summer won't be this summer. Only a minority of commuters will benefit. And all Boris did was unveil the first fruits of a project launched by Ken. Don't be over-excited. And don't read too much into it. 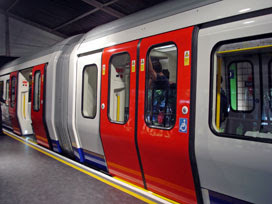 The Tube has its first air-conditioned train. That's one train. 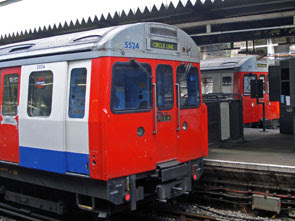 The Tube may have 500-or-so trains, but so far only one has air-conditioning. And it's not in service yet. Mayor Boris Johnson said passengers will be "terrifically impressed". Emphasis there on the word "will". He said: "For thousands of clammy Tube passengers some relief is finally in sight. The Tube has millions of clammy passengers. Alas, relief is only "in sight" for thousands. We have now begun testing the first of 191 super cool and spacious new trains." You know why the new trains are spacious, don't you? It's because there'll be fewer seats, so you'll be more likely to have to stand. Cool, but not necessarily comfortable. Mr Johnson, who boarded the new air-conditioned train at an Oxford test track, said: "Having taken it for a test run myself I can vouch that passengers are going to be terrifically impressed." The test track's actually in Leicestershire, not Oxford. Here's a website about the Old Dalby track, including some photos taken this week. And the first train started test runs there in March, it's just that Boris didn't visit until yesterday. He said the air conditioning "will keep passengers comfortable whatever the weather". "more comfortable", maybe. It'll be lovely to sit in an air conditioned train during a heatwave, but that won't stop your fellow passengers from ramming into the carriages like cattle. All the trains to have air-conditioning will operate on the subsurface lines. That's really important to know, because there are only four sub-surface lines. Passengers on the other seven lines will continue to overheat for the foreseeable future. The first will run on the Metropolitan line, to be followed by the Circle, District and Hammersmith & City. The correct order is actually Metropolitan first (starting 2010), then Circle and Hammersmith & City (starting 2011), and finally District (starting 2013). The final upgraded train won't be in service until 2015, at least six summers hence, and ten years after plans to introduce aircon were first agreed. However, the cooler trains won't be in service until next summer. You're still reading far too much into this, aren't you? Please, don't expect the entire Metropolitan stock to change overnight. The new air-conditioned trains can only be introduced at a rate of one every 10 days, so during 2010 you'll still be more likely to get on board an old hot one than a new cool one. And for commuters using the deep level lines, such as the Victoria, Central and Northern, it will be years before they get relief from the sweltering conditions. These lines were built long before air conditioning was developed and there is no space for such bulky equipment in the narrow tunnels. Oh this is so important. The deep level trains are staying hot and sweaty, and don't kid yourself otherwise. This aircon-lessness isn't because Boris doesn't care, and it isn't because there's not enough money, it's because upgrading them would be wholly impractical. Deep tube tunnels are narrower than the subsurface tunnels, so the trains have to be smaller, so there's no room to cram aircon equipment and passengers into the carriages. When you're feeling hot and sweaty down the Bakerloo, blame the Victorians, not the Mayor. The Mayor said: "Cooling the deeper lines remains a considerable challenge. A crack team of Transport for London engineers is focused on that and is concentrating on the Victoria line in particular." Don't get your hopes up. The crack engineers are focusing on the stations, not the trains. Brand new Victoria line carriages are arriving imminently, and they won't have any aircon at all. The Tube's 3.5 million daily users face yet another long, hot and very sweaty summer with in-train temperatures expected to reach as high as 47C which can cause some passengers to pass out. Do let us know when this long, hot and very sweaty summer begins, won't you? It's Midsummer's Day already, and I can't say my daily commute's come anywhere close to Death Valley meltdown yet. Measures to keep the ageing network cool have been hit by funding cuts. Instead Tube bosses will resurrect their old campaign of advising passengers to carry bottled water with them, not board a train if they feel unwell and to get off at the next stop if they start to feel ill. Faced with the choice of a multi-million pound rolling stock upgrade or a few bottles of water, guess what, TfL's plumped for the water. And that's absolutely the right choice, if you ask me. It gets unpleasantly hot on the underground for a few weeks every year, but far better to put up with that and spend the money on something that'll be of benefit all year round. Something like new signalling, or modernised stations, or repaired track - something genuinely useful. Tube passengers really need to pull themselves together and stop moaning about something which makes a few summer hours not quite as pleasant as they could be. Air con - it'll be nice to have, but it's hardly the end of the world without it. Have you seen one yet? One of the Street Pianos? They're dotted around central London, out in the open, waiting for you to turn up and play. 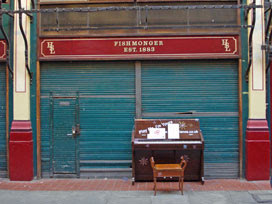 30 upright pianos, of the kind you might find in a church hall or a Victorian parlour, left out in the elements for the enjoyment of the capital's populace. Don't worry, they've all got a plastic cover for protection, so if it rains they shouldn't get soaked. 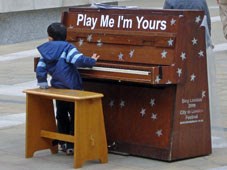 The project's entitled Play me, I'm yours, and the whole thing's a performance artwork devised by multidisciplinarian Luke Jerram*. London's not the first place he's tried this. 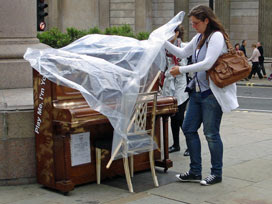 Pianos have previously been scattered across Sao Paulo, Sydney, Birmingham and (oh yes) Bury St Edmunds. Apparently Bristol's next, and they'll be getting fresh instruments because all of London's are being donated to local schools and community groups. Assuming they don't all get nicked, that is.  St Mary Axe (opposite the Gherkin): It being the weekend, all the local City workers had gone home and the piano lurked unnoticed beneath a tree.  Leadenhall Market: Another weekend deadspot, but I found it easily enough outside a shuttered fishmongers. I thought I'd have a play, so I tapped out the first phrase of Raindrops Keep Falling On My Head with one finger. My only audience was a workman up a ladder who'd been busy dropping paint scrapings onto the keyboard. Thankfully he failed to sing along.  Liverpool Street Station (main exit): I didn't find this one. I'd made the mistake of printing out the map on the website which led me to the wrong "main exit". Ah well.  London Wall: I didn't find this one either, because the pin on the website map was in completely the wrong place. If only I'd read the dedicated webpage before I left the house I'd have found it, but I didn't. Take heed, oh piano hunters.  Royal Exchange Buildings: Another piano not quite where the map said it was, but I found this one by the tube station entrance. So did a passing group of four European tourists who lifted the plastic cover and attempted to take arty photos of one another playing. They also managed a recognisable chunk of Do Re Mi.  Brown's (Old Jewry): This one's a grand piano, but it's a bit of a cheat. It's not in the street, it's inside a restaurant. It's only available to play between 9am and noon, before paying lunch punters arrive. And it's accessible weekdays only. I saw nothing.  St Mary-le-Bow Churchyard: Another lonely sidelined instrument, being stared at (but not used) by coffee-drinking punters in the cafe nextdoor. Rather more popular midweek, it appears.  Paternoster Square: Blatantly positioned, and an object of intermittent interest. "Oh I've heard of this," said one woman to her significant other, before walking past. A couple of families stopped to allow their small children to climb up onto the stool and pretend to play. I hung around for five minutes, but no tunes emerged.  St Paul's Churchyard: Big churchyard, didn't find it, couldn't hear it either.  Millennium Bridge (north side): At last, a crowd. Piano + footfall = atmosphere. **** A group of boys had stopped by (more public school than inner city estate), and one got busy showing off his classical skills to the assembled youngsters. Piano + talent = rare. But he played nothing anybody else knew. Piano + singing = non-existent. *This is not a Boris-inspired part of the Story of London Festival (Luke seems quite keen that people realise this). ** London's Street Pianos will be available for creative mayhem until July 14th. *** Michael toured the City pianos over the weekend, and found them similarly underused. **** The piano in Soho Square looked rather livelier last night. Could be a winner, this. You may never have been to the Croxley Green Revels, but you've probably seen John Betjeman waxing semi-lyrical about it [two minutes into this YouTube clip, if you haven't]. He stopped by in the early 70s to observe the Queen of the Revels in procession round the village, then gently mocked the fair's pomp and faux-heritage before rushing on to some architectural delight in Chorleywood. 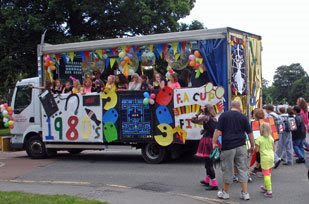 I, on the other hand, have been to the Croxley Green Revels many times, because this is the village where I grew up. I don't appear in the documentary but I'd have been there somewhere, standing out in my front garden to watch the procession go by, or stuffing my face with an ice cream cornet on the village green afterwards. Yesterday I went back to Croxley on Revels afternoon, after a couple of absent decades, to see if anything much had changed. And, reassuringly, not really. Quarter to two along New Road, and families still emerge into their tiny terraced front gardens to watch the parade go by. Some stocky dads lean over the fence with lager in hand, others seat their children in canvas chairs at the roadside to get the best view. In my day the Queen of the Revels used to lead the parade on the back of a haycart, sat amongst a court of giggling teenage girls wearing cloaks made out of glossy curtain fabric. Nowadays the chosen form of transport is an electric blue Ford Consul, and the royal party has been downgraded to one miniature princess with three attendants from the local primary schools. The usual motley selection of dressed-up lorries follow on behind, no less imaginatively themed than before although rather fewer in number than I remember. Most of the participants are schoolkids or churchgoers, with smiling OAPs and vintage penny-farthing riders interspersed for good measure. Be patient, normal through traffic will be restored just as soon as the lady in the Fairtrade banana costume has waddled through. Everyone in the village (if you can call a dormitory suburb with twelve thousand residents a village) then wanders up to the top of the Green for all the fun of the fair. No big wheels or waltzers here, this is a rather tamer affair set around a central arena. Various community organisations are out in force running their own stalls, from crockery smashing with the Scouts to the local church's pancake tent. 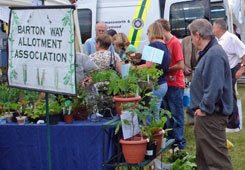 Spend your pennies wisely and you might go home with a pot plant, a Victoria sponge or even something big and inflatable. I was pleased to find a few lambs penned up in one corner as a reminder of the area's rural past, and relieved not to win a box of lavender smellies in the Macmillan Cancer tombola. Splat a teacher, fish for a rubber duck and queue for a barbecued burger - this event hasn't changed in years. The focus of the afternoon is always the central arena. 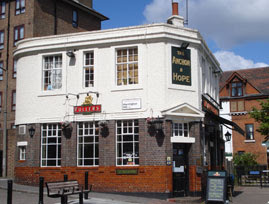 This is where the Revels princess gets crowned, and also where she reads a speech from a scroll to "my people in Croxley Green". Neither her tiara nor her proclamation has changed since 1972, I noted reassuringly (even if her throne now looks suspiciously like a garden chair with a bit of gold material thrown over it). Page boy Owen, however, was no doubt relieved that his headgear was a jaunty top hat rather than the embarrassing black floppy felt number of yesteryear. Several of Croxley's more active associations get to showcase their activities in the arena during the afternoon, giving mums and dads a chance to ooh and ahh at the assembled tiny dancers and taekwondo white belts. And this is also where the maypole dancing takes place. 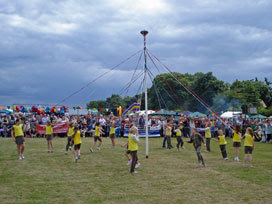 This rural tradition is taken very seriously in Croxley Green, far more so than in most other UK villages, so much so that my upper junior class was drafted into forming the ribbon-twirling squad back in the 1970s. I was very good at it, apparently, but thankfully no cinefilm of my pole dance survives. These days the Brownies perform the honours, and yesterday they did a fine job of skipping in circles until a disastrously tangled "Double Braid" proved their undoing. Almost everything about the event felt somehow familiar, even down to the happy crowds of young and old milling around the Revels site. But one thing had undoubtedly changed, and that was who they all were. I walked around all afternoon barely recognising anybody, not a soul, that I once knew. All my old schoolmates had moved on, or at least grown up and disguised their features behind wrinkled brows, middle age spread and grey-specked hair. I couldn't be sure, but maybe that was them watching their kids performing in the maypole dancing or footballing display - a generation removed, a tradition maintained. Croxley's community may have transformed, but this New Elizabethan custom shows no sign of dying out yet. Yesterday's Digital Britain report hid a nasty surprise. Radio's changing, forever. Prepare to throw your old sets away. At the heart of our vision is the delivery of a Digital Radio Upgrade programme by the end of 2015. The Digital Radio Upgrade will be implemented on a single date, which will be announced at least two years in advance. On the determined date all services carried on the national and local DAB multiplexes will cease broadcasting on analogue. Normally listen to Radio 4 on an old transistor? Not any more. Listen to Classic FM in the car? Not on your current set. Wake up to the local breakfast show on your bedside clock radio? Not in the future. All the stations you currently listen to will be migrating from FM to DAB, so if you don't have a digital radio you'll not be able to listen. Upgrade, or lose out. 2) When national DAB coverage is comparable to FM coverage, and local DAB reaches 90% of the population and all major roads. But it's the government's intention that both of these migration criteria should be met by the end of 2013, and that means 2015 (at the very latest) for analogue radio switch-off. There'll be plenty of other ways to access radio by 2015, of course. Digital radio's already accessible on digital TV, and online, and on DAB radios, with these media apparently already accounting for a quarter of all radio listening. In the future your mobile phone will probably be DAB-enabled, and there's bound to be a radio-friendly iPod at some point. But I suspect that a large proportion of the UK population are going to take a lot of persuading to make the switch. I could listen to the radio on my television, but I almost never do. I prefer to use my TV to watch rather than listen, and it always seems a complete waste of electricity to light up a big screen for no particularly good reason. I could listen to the radio on my computer, but I almost never do. I don't want an extra window swallowing valuable bandwidth, and I don't need additional sounds blaring out of tinny speakers when the internet's full of noise anyway. And I could listen to the radio on my Pure maplewood digital radio box, but I only get decent reception in one corner of one room which restricts listening somewhat, and the sound quality's not as good as FM is it? Instead my home listening revolves around good old analogue. I wake up in the morning to an Argos clock radio circa 1987. I get ready for work to the sounds of a ghetto blaster circa 1991. While I'm in the kitchen, I rely on an ancient music centre circa 1983. And in the living room, when I want to listen to the radio in proper stereo through a decent set of speakers, I switch on my faithful hi-fi circa 1996. Works well enough for me. But come 2016 all of these radios are going to be useless, and I can either keep them as heritage instruments for listening to cassettes and CDs, or it's down the tip with them. We must ensure the environmental impact of any significant analogue radio disposal is minimised through a responsible disposal and recycling strategy. I'm not going to be left bereft of radio, obviously, but it's going to cost money to regain the same penetration that radio has in my life today. And I'm almost certainly amongst the better-prepared digitally to cope with this upcoming revolution. Imagine trying to persuade every household in the country that every one of their old analogue radios needs to be binned and replaced. Shiny push-button boxes for all, in your bedroom, in your living room and in your car. Radio penetration could be taking one big step back just so that radio can take a very big step forward. If listeners are to adopt DAB they must be convinced it offers significant benefits over analogue. DAB should deliver new niche services, such as a dedicated jazz station, and gain better value from existing content, such as live coverage of Premiership football or uninterrupted coverage from music festivals. You may be thinking "Bring it on." You're a cutting-edge blog-reading online adopter, and embracing the drive to digital isn't going to worry you. You may be thinking "I want greater choice and wider diversity and improved functionality and a hugely enhanced radio spectrum." Yeah, me too. But I don't relish an enforced move to a new digital platform, making all my existing equipment obsolete, just so that the FM spectrum can be parcelled up for a variety of temporary "ultra-local" services. And I suspect I'm not alone.